When a user that is assigned PM Schedules leaves your organization, you will need to reassign those PM Schedules to another user. You can do this with the Batch Reassign feature. This feature will change the Assigned To information on the PM Schedule so that future work orders generated from that schedule will be assigned to the correct person. *Note: This will NOT change the assignment on any previously generated work orders from that schedule. Click on the PM Schedules link under the Information Analysis section of the home page. Click Batch Reassign in the PM Schedules Shortcuts section at the top of the page. This screen will show you a list of 10 schedules at a time. You can sort the list by the Assigned To column. 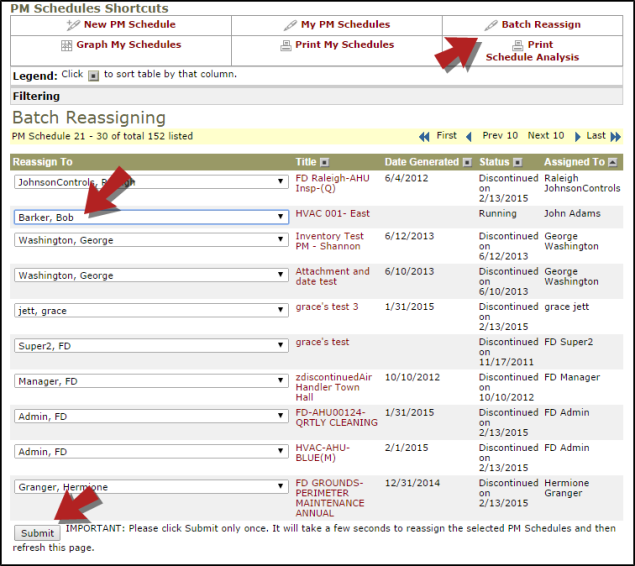 Find the schedules that need to be reassigned and use the Reassign To drop down field to select the new user. Click Submit at the bottom of the list if you have made any changes to those schedules. *Note: Be sure to click Submit at the bottom of each page or your changes will not be saved when you view the next 10 schedules.